I don’t have a clue where this was published… or even if it was. It was written in 1996. It has been said that sport is often a simple substitute for warfare, an opportunity for lifelong belligerents to tackle the might of their foes without resorting to actual armed violence. It is not a foolproof gambit, even if one overlooks the episodes of on-field violence which hysterical sports commentators like to describe as war. During the qualifying tournament for the 1970 soccer World Cup, El Salvador and Honduras met in a game which really did end in the outbreak of fullscale hostilities, while Israeli participation in soccer’s best known competition has frequently been hamstringed by the Jewish states’ neighbors’ refusal to play her. These incidents are well-documented elsewhere. There was one other occasion, however, which though it did ultimately end peaceably, certainly had the potential to create a major diplomatic incident; which might, given the already precipitous nature of relations between the two nations involved, not only have led to war, it would have brought World War Two itself forward by a full 16 months. Instead, it has simply gone down in sporting history books as “the little World War,” further proof that not every national difference can be resolved on the field of play. On May 14th, 1938, England’s national soccer team traveled into the heart of Hitler’s Germany and, in front of almost every Nazi dignitary in town, whipped the Master Race by six goals to three. The game was the first of the three matches England were scheduled to play that month. Switzerland and that year’s World Cup hosts France were also on the agenda and, while all three games were billed as friendlies, nobody was taking them at all lightly. Having withdrawn from soccer’s international governing body, FIFA, a decade previous, England were, without doubt, the most significant absentees from the World Cup tournament. In 46 officially recognized “International” games against European opposition, dating back to 1908, England had lost just six times. Of their conquerors (Spain in 1929; France in 1931; Czechoslovakia and Hungary in 1934; Austria and Belgium in 1936), only one, France, had defeated them by more than a single goal. No Continental team had ever bettered them on their home turf, while England’s defeat of FIFA’s own World Champions Italy ensured that regardless of their “official” status, England were truly the masters of the game. In Berlin, however, Hitler had other ideas. While the 1936 Olympic Games in Germany had not panned out exactly as he had planned them, still Nazi Germany had proved itself a force to be reckoned with in world sports. German athletes won 33 Gold, 26 Silver and 30 Bronze medals, and established new Olympic records in the Shot and Hammer events, and while Germany’s Olympic soccer hopes had taken a very early bath, so had Great Britain’s (the four United Kingdom nations at that time pooled their resources for Olympic competition). Both sides had been confident of taking the Gold, both had tumbled in the Second Round; Britain to Poland, Germany to unfancied Norway. But Hitler had no doubts that this time, his Master Race would not only beat the English, they would annihilate them, erasing in the process German soccer’s previous miserable record against them. Soccer-playing relations had never been good between the two countries. Early, amateur level encounters had ended in almost uniform humiliation for the Germans: in Berlin in 1908, England won by 5-1; in Oxford the following year the English came through by 9-0; and while 1911 brought a 2-2 draw in Berlin, 1913 saw a visiting England notch up a fine 3-0 win. Neither would matters improve after the Great War. Indeed, in 1919, England joined Scotland, Wales, Ireland, France, Belgium and Luxembourg in refusing to remain members of any organization – FIFA included – in which Germany, Hungary and Austria were also involved. All seven nations recanted in 1924, but it was the end of the decade before Britain’s relations with the three wartime aggressors at last began to take on a semblance of conviviality. Scotland were the first of the four United Kingdom nations to play Germany at full International level, leaving Berlin in June, 1929 with a very credible 1-1 tie. The following May, England were held to a 3-3 draw, again in Berlin, and in May, 1935 Germany won their first, and only, victory over a British team, 3-1 against the Republic of Ireland in Dortmund. That December England defeated a visiting German team 3-0 in London; the following October, a second German tour saw the Irish romp home by 5-2 in Dublin, Scotland by 2-0 in Glasgow. The match with England in 1938, then, was more than a simple game of soccer. For Germany in general, and Hitler in particular, it was a matter of national pride. For England, on the other hand, the game came at the end of a particularly tiring season. The annual British Home International Championship had been even closer than usual, with Scotland snatching their first Wembley win in 10 years. The domestic season, too, had taken a harsh toll on the England squad, drawn as it was from the cream of England’s soccer elite. Eddie Hapgood and Cliff Bastin, veterans of the Arsenal club, were both exhausted from their team’s dramatic last minute run for the Championship. Aston Villa’s Frank Broome – like Charlton Athletic’s Don Welsh, set to make his first ever appearance in an England shirt – was similarly drained after his team’s triumph at the top of the Second Division. Other England regulars, Stan Cullis of Wolves and Arsenal’s Wilf Copping included, were not even expected to play. Huddersfield’s Ken Willingham and Alf Young, the latter fresh from the disappointment of giving away the penalty which ensured his side’s defeat in the prestigious FA Cup Final, could also have been excused had they felt a little short of their best. And the greatest English player of them all, Stanley Matthews, was still recovering from his side Stoke City’s narrow escape from relegation. The team radiated exhaustion, disappointment and disillusion, and that is what German strategists were relying upon. Six members of the England side which had fallen to Scotland, but only three of those who had battled to a fine 5-4 win over Czechoslovakia in the match before that, were chosen to meet the Germans, with the final eleven lining up as: Woodley (goalkeeper with the Chelsea club); Sproston (Leeds United); Hapgood (Arsenal); Willingham and Young (Huddersfield); Welsh (Charlton); Matthews (Stoke); Robinson (Sheffield Wednesday); Broome (Aston Villa); Len Goulden (West Ham) and Bastin (Arsenal). Against them were pitted a German side selected not only from within the country’s traditional borders, but also from Austria, annexed to Greater Germany just two months previous. Indeed, the side was coached by an Austrian, Josef Pesser, who had masterminded so many of his home nation’s past soccer triumphs. All of Germany expected him to weave similar magic for the Fatherland. Elsewhere in the team, Jakob was amongst the most formidable goalkeepers in Europe. Muenzenberg had already proven his worth against England when his control of Stanley Matthews had all but snuffed the player out of the game in 1936, while his partner in defense, Paul Janes, and the gallant attacker, Josef Gauchel, would surely have ranked in any All-Europe XI. But they were an aging side, overflowing with names which had been familiar to German audiences even at the time of the 1934 World Cup (a tournament, incidentally, in which Germany’s victory over Austria in the Third Place Play-Offs remained the apex of the country’s soccer success.) Any doubts as to England’s sharpness had surely to be offset against that factor. There were deeper currents running below the surface, however. In England itself, the decision to even play Germany in the first place was widely regarded as a strange one. Under the nervously watchful eye of all Europe, Hitler had completely revitalized Germany, flying in the face of every one of the treaties agreed at the end of the Great War as he did so. The absorption of Austria notwithstanding, his policy of Lebensraum had already seen German boundaries increase far beyond those proscribed in 1919, and while the process had been remarkably bloodless so far, throughout Europe’s corridors of power, few people doubted that there would come a time when armed might would replace propaganda and appeasement in the growth of Greater Germany. The match also had a variety of political implications. At the 1936 Olympic Games, a number of athletes had refused to offer Hitler the traditional Nazi salute, infuriating the Fuehrer and sending further, nervous palpitations throughout Europe. In both London and Berlin, worried diplomats were adamant that a repetition of that incident could never be permitted to happen. 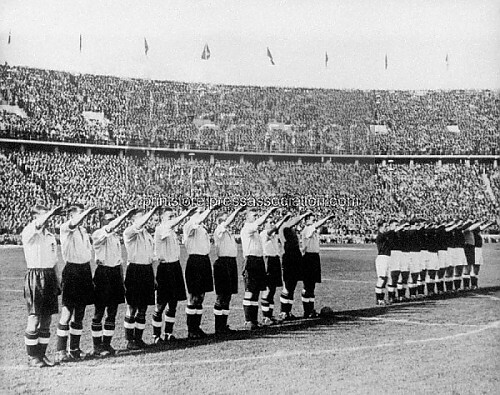 At the same time, however, would not the sight of English soccer players saluting Hitler be seen by the rest of the world as an endorsement of Hitler’s policies? Certainly Josef Goebbels’ Ministry of Propaganda would have no hesitation about portraying it as such. The England team were literally the chosen ambassadors of their nation; how they conducted themselves would automatically be seen as an indication of their own government’s sentiments. The England players themselves were far from happy about giving the salute. While Hitler’s Germany was still more than a year away from attaining the devilish status with which it is today remembered, still it, and the politics which controlled it, left many people feeling distinctly uneasy. Against them, however, were ranged those men whose belief was that the salute should be given, not as a sign of approval but simply as a matter of courtesy. International soccer had long since developed the tradition of playing, and respecting, both competing nations’ National Anthem, during which both teams would stand rigidly to attention. In Germany, the Nazi salute had, for better or worse, become an intrinsic part of that ritual. Failure to comply would be nothing short of insulting. Against this argument, against the voices of FA Secretary Stanley Rous, committee member Charles Wreford, and Britain’s ambassador to Berlin, Sir Neville Henderson, the dissidents were powerless to resist. The England team would offer the salute. Eddie Hapgood later admitted, albeit with words heavily colored by post-war sentiment, that giving that salute was “the worst moment of my life.” But that afternoon at Berlin’s Olympic Stadium, his right arm was as straight as any other as the band struck up “Deutschland Uber Alles”. So were those of the rest of the team, of their opponents and of their audience. The watching Nazi officials (Hitler alone chose not to attend, sending deputy Hess, Goering, Goebbels and Von Ribbontrop along in his stead), were in seventh heaven. But they were not to remain there for long. From the moment play commenced, England were in control, and after just twelve minutes, Matthews had shrugged off Muenzenberg and launched the ball towards Goulden. Jakob, in goal, barely got a fist to the ball, but the rebound went only as far as Bastin, who gratefully slotted the ball home. First blood to England. Within minutes the Germans were level, capitalizing on England’s celebrations to hammer home a goal which a more aware defense would never have let past. It was England’s last significant mistake. Suddenly galvanized, a through ball from Bastin was clinically slammed into the German goal by Robinson. Welsh sent his fellow debutante, Broome, through for England’s third, and as half-time loomed, Matthews weaved an incredible journey through the German defense, beat four defenders, then unleashed a shot which gave Jakob no chance. Virtually the last shot of the half gave Gauchel the gratefully accepted opportunity to pull one back for the Germans, but still England’s lead seemed unassailable. Certainly the watching thousands thought so. Where once there had waved a seething mass of red and black banners, now only the infuriated Goering’s face retained the colors of the Nazi flag. The constant roar which had welcomed both teams onto the pitch 45 minutes previous was gone too, to be replaced by a discontented muttering and predictions that in this mood, England were unstoppable. And it seemed as though they were. The second half had barely commenced before Robinson punched in his second, and England’s fifth goal of the game. Again the Germans rallied, Pesserhitting home a fabulous goal, but still the yawning gulf between the two teams could not be bridged. Instead, Goulden increased it, collecting Matthews’ perfect pass from 25 yards out and, with barely a pause, thundering the ball past Jakob and into the net. Hitler was furious, more furious even than he had been following Germany’s appalling performance in the Olympic soccer tournament. He berated the team, he berated their coach, he even berated Goering, Goebbels, Hess and Von Ribbontrop, arguing that if only they had shown greater enthusiasm during the match, then both players and supporters would have rallied to the cause. His temper was not improved by England’s next result. Against Switzerland in Zurich, the visitors fell first to an easy goal from Aeby, equalized through Bastin, but ultimately lost by 2-1 against a team whose defense normally boasted more holes than a piece of their own country’s cheese. And while England went on to defeat France 4-2 in Paris, paving the way, perhaps, for the surprisingly early exit which awaited the host team when the World Cup got underway in Paris at the end of the month, for Nazi Germany the future was even grimmer. They were dismissed from the World Cup at the very first hurdle, by Switzerland, and even as Hitler prepared the gameplan which was to take so much of Europe by storm little more than a year later, the soccer team which he believed would first spread the word by more peaceful means lurched from disappointment to disgrace. On May 23, 1939, in one of the last International soccer matches played before the lights finally went out across the continent, the little fancied Republic of Ireland traveled to Bremen, saluted the Fuehrer, and went home with a 1-1 draw under their belts. Hitler should have realized there and then – not even the small fry were easy meat any longer.